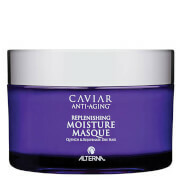 Rejuvenate damaged hair with Alterna Caviar Anti-Aging Restructuring Bond Repair Masque; a regenerating treatment that restores softness, moisture and shine from root to tip. Harnessing the powers of Panthenol and omega-rich Caviar Extract (sourced from France), the revitalizing hair mask strengthens and hydrates, whilst helping to protect against future breakage and damage. 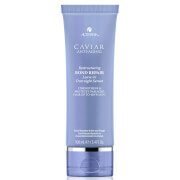 A blend of marine botanicals improve elasticity and manageability for healthy-looking, deeply conditioned locks. 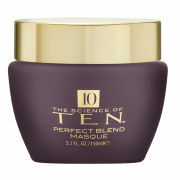 Free from parabens, sulphates and synthetic color. Water/Aqua/Eau, Cetyl Alcohol, Stearyl Alcohol, Brassicamidopropyl Dimethylamine, Cetyl Esters, Neopentyl Glycol Diheptanoate, Behentrimonium Methosulfate, Cetearyl Alcohol, Glycerin, Cetrimonium Chloride, Dimethicone, Hydrogenated Castor Oil/Sebacic Acid Copolymer, Isododecane, Fragrance (Parfum), Silicone Quaternium-16, Benzyl Alcohol, Behentrimonium Chloride, Guar Hydroxypropyltrimonium Chloride, Citric Acid, PEG-7 Amodimethicone, Glyceryl Stearate, Polyquaternium-55, Butyloctanol, Undeceth-11, Undeceth-5, Dehydroacetic Acid, Ascorbic Acid, Helianthus Annuus (Sunflower) Seed Oil, Panthenol, Polysilicone-15, Retinyl Palmitate, Superoxide Dismutase, Tocopheryl Acetate, Alaria Esculenta Extract, Caprylic/Capric Triglyceride, Caviar Extract, Potassium Benzoate, Propylene Glycol, Sodium Sorbate, Leuconostoc/Radish Root Ferment Filtrate, Saccharomyces/Copper Ferment, Saccharomyces/Iron Ferment, Saccharomyces/ Magnesium Ferment, Saccharomyces/Silicon Ferment, Saccharomyces/Zinc Ferment, Phospholipids, Hexyl Cinnamal, Linalool, Limonene, Geraniol, Coumarin, Citral, Amyl Cinnamal, Benzyl Benzoate, Benzyl Alcohol, Citronell.